Today, June 30, 2009, the National Agricultural Statistics Service (NASS) of the U.S. Department of Agriculture released its annual Acreage and Grain Stocks reports. These reports provide useful information about planted acreage and amounts of grain in inventory. The acreage report indicates planted corn acreage is up one percent from 2008 to an estimated 87 million acres. Besides 2007 this is the largest planted acreage since 1946. Traders were expected either for corn acreage to stay the same or decrease, therefore, we may see an initial decrease in corn price. For Kentucky, planted corn acreage is up 10,000 acres to 1.22 million acres from 2008. Corn stocks are estimated to be up 6 percent from last year to 4.27 billion bushels. For soybeans, U.S. producers have planted an estimated 77.5 million acres – a record and up 2 percent from 2008. This amount of planted acreage is less than trader expectations, which may positively affect prices. For Kentucky, planted soybean acreage is up 60,000 acres to 1.45 million acres from 2008. Soybean stocks are estimated to be down 12 percent from last year t o 597 million bushels. For winter wheat, NASS estimates planted acreage at 43.4 million acres, six percent lower than 2008. Of which 8.4 million acres are Soft Red Winter. For Kentucky, planted winter wheat acreage was down 50,000 acres to 530,000 acres from 2008. All wheat stocks are estimated to be up 118 percent from last year to 667 million bushels. Even with this information, corn, soybean, and wheat prices can still be influenced by a number of factors, especially yields. There is still a lot of the growing season left to put downward pressure on yields. You can reach Cory Walters at cgwalters@uky.edu. Soybean aphid has been showing up in the upper mid-west for several weeks. This pest can be a big problem in soybean production, but has not historically been so in Kentucky. We hope, and in the short run expect, that this will remain the same, at least for 2009. It is however, important to remember that this pest can and does infest Kentucky grown soybeans. If its' biology and/or short term weather patterns change then we may see more of this pest than we wish. As of this writing we have not found any soybean aphids in our sentinel plot system. The aphid suction traps in Lexington and Princeton have not caught any soybean aphids. Additionally, I have not received any reports from agents or consultants (who often find the first aphids). So, at present wer are in good shape with reference to soybean aphid. I see no reason, except late plantings, to assume that anything other than the norm will occur this season. However, you should keep your eyes open! You are encouraged to report soybean aphid finds to doug.johnson@uky.edu. I will use your information to keep us all informed. For more complete stories see Kentucky Pest news at: http://www.uky.edu/Ag/kpn/kpnhome.htm. Last week, I posted an image of a corn plant and said that it was possibly deficient in Mn. 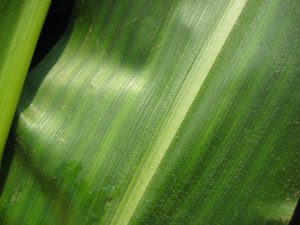 Dr. John Grove quickly met me with some corn plants with similar symptoms: yellow or chlorosis between the veins and green along the veins. Image of those plants are below. Corn plants from four N rates (0, 67, 133 and 200 lbs/acre, respectively). In each case, the interveinal chlorosis is N deficiency. The symptoms are much more evident as N rates get lower, but observing this chlorosis does not mean that yields are limited. Even in corn from 200 lbs N/acre, slight interveinal chlorosis is evident. 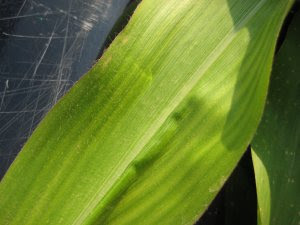 Photo: Possible Mn defiency in corn, which is most likely due to weather and not lack of Mn in the soil. 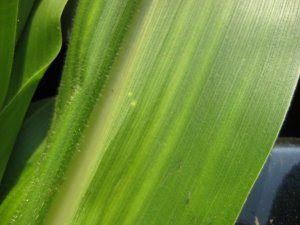 Believe it or not, corn has emerged on 96% of the acres in Kentucky which is right in line with the five-year average, according to the Kentucky Crop and Weather Report. While emergence is on track, planting was not, and management decisions need to be adjusted. Preplant nitrogen fertilizer and preplant herbicides may have been lost to the heavy rainfalls. Farmers may need to sidedress additional N and apply postemegernce herbicides. Because of the late planting, farmers will have a smaller window to make these postemergence applications. Corn planted April 1 will likely reach V6 growth stage in 35 days, while the same hybrid planted May 15 will reach V6 in about 22 days. Corn planted even later will reach V6 earlier. Many postemergence herbicide labels have restrictions for V6 corn. Corn will need about 20 to 40 lbs of N/acre through about V6. If additional N has not been applied by V6, then yield losses can be expected. Determining how much N fertilizer or herbicide was lost from the heavy rains is not easy. A calculation for N fertilizer lost is available in the Corn and Soybean Newsletter from April. Assessment of herbicide losses are more of a case-by-case assessment. 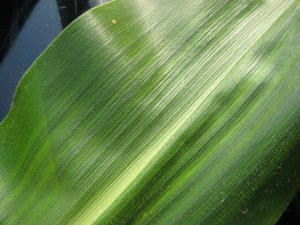 In addition, the rapid growth and wet weather can result in some transient nutrient deficiency symptoms...symptoms where weather has more to do with nutrient deficiency that availability of the nutrient. Normally in these cases, the best cure is sunshine and warm weather. Often farmers will spray a foliar fertilizer over the top and a couple days later the crop turns greener, but it may not yield any more. We always suggest to leave a test strip, and take both the treated and non-treated areas to yield. As always, consult your county agents for more information. The barley contest is new this year and is being administered by the University of Kentucky, but is fully sponsored through Osage BioEnergy, a company interested in turning barley into fuel ethanol. The wheat yield contest is administered by the University of Kentucky and is sponsored by the Kentucky Cooperative Extension Service, Kentucky Small Grain Growers and several agribusinesses. While the entry forms are different, the rules are very similar for the two contests. Contact your county extension agent if you have questions/comments about either contest. The USDA Crop Progress and Condition Report for June 7, 2009 indicates that soybeans planting is 48% completed, well below the 5-year average of 71%. About 32% of the soybean plants had emerged. Normally, for full season soybeans, we suggest that a final stand of 100,000 plants per acre is sufficient for maximum yield. However, we are getting later into the season. For full season soybeans planted today or later, farmers may want to increase the goal of a final stand to 140,000 plants per acre. Double-crop soybeans (soybeans planted into wheat stubble) should attempt to get a final stand near 160,000 plants per acre. In addition, any soybeans being planted today or later should be in row widths of 15 inches or less. The recommendation for the higher target population and narrow rows, is because a fundamental principle for higer yields is getting full canopy closure when the soybeans flower. These later planting dates require more soybean plants per acre and narrow rows to get to full canopy closure by the time the soybeans flower. The Wheat Science IPM Group Newsletter was released on June 4, 2009 with the latest information for mangaing wheat with Fusarium head blight (or head scab) this season. A recent report from Dr. Clayton Hollier with Louisiana State University (LSU) documented the first find of soybean rust (SBR) on soybean in Louisiana and the U.S. for 2009. The find was in a soybean sentinel plot at the R4 (mid-pod) stage. That is a fairly early stage for a first find of SBR and it is cause for some concern (but NOT alarm). Usually, the first find of SBR in soybean for the year is made in beans that are at a later stage of development (late R5 or later). According to a crop consultant I spoke with in southern Louisiana, this is the first time that SBR has been found in soybean BEFORE his growers had a chance to make fungicide applications. His point was not that they have “missed the boat”, but rather to indicate the earliness of this find relative to what they are used to seeing in southern Louisiana. To back up his statement, he told me about a rather large kudzu patch near an local apartment complex that LSU scientists regularly monitor, and that historically has developed massive SBR infections later in the summer. He said that patch is now heavily infected and is showing profuse sporulation. The weather conditions in much of Louisiana have been favorable for SBR for quite some time. So, this earlier than usual find does not come as a great surprise. The US, from south to north, has a great many acres planted later than normal this year. This could increase the crop risk for SBR, but not necessarily so. We could have a late season dry period that shuts the disease down; or not. Time will tell, and I cannot rule anything in or out at this time. Thus, I encourage you to stay tapped into trusted sources of SBR information. As I learn more details, I will be certain to pass them along. Proper prior planning! This is the essence. Let there be no doubt that preventing a problem in stored wheat is by far more effective and economically sound than solving a problem that could have been prevented. Prepare bins two weeks ahead of time. Insure your bins are in good repair. Even small holes will allow insect entry. Be sure the roof does not leak! Do not store with carryover grain. Thoroughly clean all equipment from the combine to the bin to avoid seeding the newly harvested grain with insect pests. Consider fumigation of areas below perforated floors and in aeration ducts. Get a professional fumigator to do this dangerous task, correctly. Save your life and money in that order. Treat the insides and around the outsides of bins with an approved insecticide. Bin dry wheat if possible at 12 to 12 ½ % moisture. Move air through the grain to reduce temperature any time that is possible until the grain temperature is below 50 F. Consider installing automatic fan controllers. If you use an insecticide applied to the grain, make sure it is labeled for that purpose. If you use a grain dryer do not apply insecticide before the grain moves through the dryer and until the grain has cooled after exiting the dryer. Check your grain regularly. At a minimum look in the hatch and use your nose to perform a “sniff test” to detect out of condition grain. Insect traps can be a good indicator of problems if you will learn to use them. Do not wait until delivery time to look for insects. That is often too late for any remediation.